The hottest new trend in Green Smoothie recipes is to add either Almond Milk, Soy Milk or Coconut Water instead of plain water. Let’s face it, people love the thought of adding more nutrient power to their health drinks, and it seems like a good idea, right? Well, it’s only a good idea if you are interested in adding artificial chemicals, and increased sugar and fat to your Green Smoothie, and that doesn’t sound like a good idea to me! Actually, it’s the fastest way to contaminate the beautiful, fresh raw food delight of a Green Smoothie. Not to mention adding a lot of hidden extra calories that you don’t even really taste. So, if you are not losing weight from your daily Green Smoothie, the answer could lie in that added almond milk, soy milk, or coconut water. It even says ‘No Added Sugar,’ a term which is not regulated by the FDA by the way, and when you look on the back you will see that there are 13g of sugar in one serving! So, essentially, all of the calories in this drink are from sugar!! With so much sweet flavor from fresh, natural fruits in a Green Smoothie, there is simply so need to add more sugar and it’s simply a waste of calories for anyone looking to watch their weight. Why add 13g of added sugar to a Green Smoothie that’s already full of fresh sweet fruit? This bottle is 16 ounces and contains a total of 22 grams of sugar. 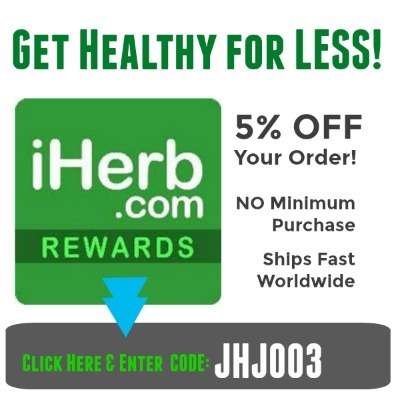 Most people mistakenly think that they do not eat any added sugar in their diet. Clearly this is not the case! 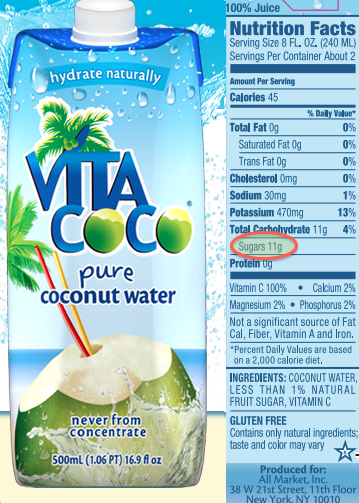 While coconut water does have some natural sugar in it, real young green coconuts never taste as sweet as the coconut water being sold in the USA. So something is going on to make then taste extra sweet. Not to mention the fact that all coconut water imported into the USA has been irradiated, yet another reason to re-consider having too much bottled coconut water in the diet. 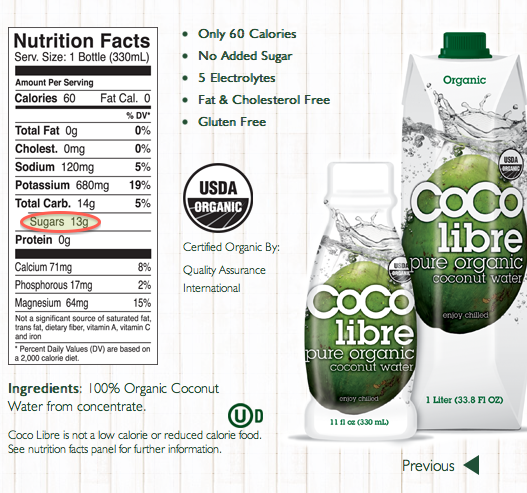 11g of sugar in a 8oz serving of this Coconut Water? It’s true! Many reasons not to drink this or any soy milk for that matter, and again, why contaminate a perfectly pure and natural Green Smoothie with these ingredients? 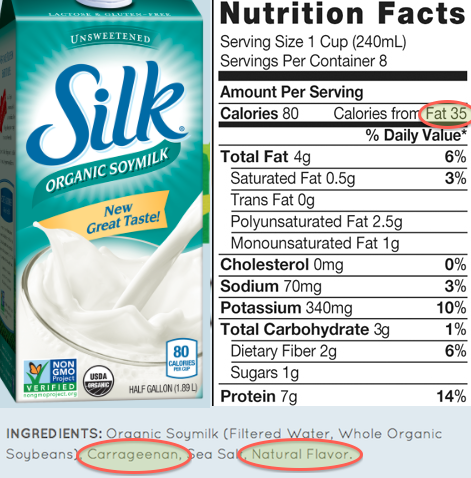 Here we have added sugar and 2 suspicious food additives on the label: “Carrageenan” and “Natural Flavors.” Carrageenan is a thickening agent which is known to increase inflammation in the body, in especially gastrointestinal inflammation. The term “Natural Flavors” essentially has no regulation so there can be anything under the sun in it, and it’s usually nothing natural! This is the classic way that food manufacturers hide chemical additives like MSG. And, yes, it is legal. Anytime you see that term on a label, it is a food best to leave on the shelf! Of course, the other issue with soy milk is the Genetically Modified issue. More than 90% of soy in the USA is GMO. That makes the soy higher in certain proteins which are known to trigger food allergies and intolerances, especially in children whose smaller bodies can’t handle the excess proteins in unnatural amounts. The other major issue with GMO foods is the direct link to infertility. Isn’t using plain water in your Green Smoothie suddenly sounding like the obvious healthy choice? Don’t think you are doing much better by choosing the organic non-GMO version of soy milk. As you can still, they are still using Carrageenan as a thickening agent and a nice inflammatory food to add to your organic soy milk. In addition, who knows what they are hiding in those “Natural Flavors?” It could literally be anything, and it’s legal of course. 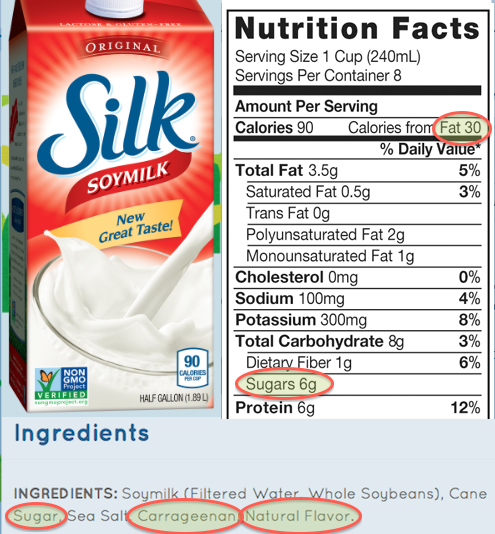 The other issue with soy milk is that it is highly concentrated in phyto-estrogens (whether organic or not) and this is also not good for long-term use. High amounts of estrogen are linked to many health conditions for both female and male sexual reproduction hormones. Men can actually grow breasts from high amounts of estrogen! Stick with water in your Green Smoothie, add some 100% organic superfoods for an added nutritional boost, but stay away from the soy milk! 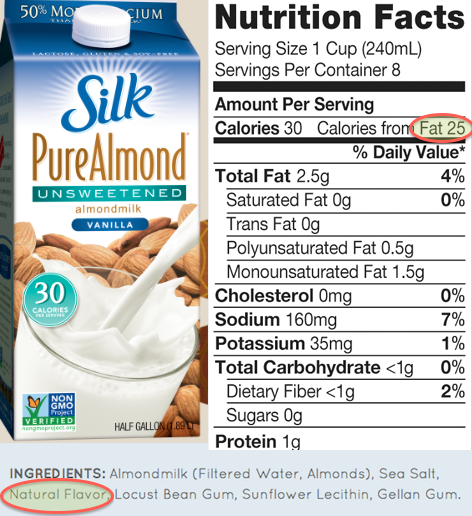 Here we have added sugar, and of course the almonds are naturally high in fat which is more concentrated in a liquid form. Why not eat whole, raw almonds later in the day as a snack? That way you can actually enjoy the taste and spread your caloric load throughout the day. With so many people trying to lose weight, I can’t understand the desire to add additional sugar to a perfectly naturally sweet Green Smoothie. Organic Products can still contain chemical food additives? Yes!! 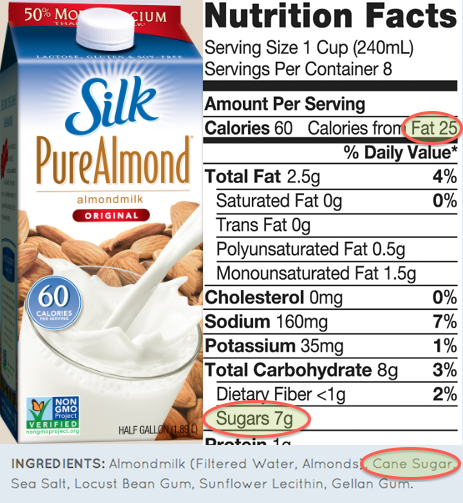 Here you can see that there is essentially no added sugar, so this seems like a good choice….but, how exactly do they make this almond milk taste sweet and have vanilla flavor? 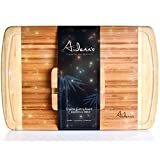 Have you checked how expensive pure vanilla beans are lately? I don’t think they are adding them! That term “Natural Flavor” is screaming out to me, flashing warnings that this food is not natural at all. There could be all kinds of artificial flavor enhancers in there and the food manufacturer does not have to list them on the label. Simple as that. Again, why add more chemical additives to your diet? Plain, raw whole almonds do not have the term “natural flavor” on the package! Added sugar and fat is not needed is a naturally sweet Green Smoothie! While there is no official government standard on how much (refined) sugar to consume daily, most nutritionists will agree on a recommended daily intake of no more than 40 grams. If you choose to put these sugar-laden drinks into your Green Smoothie, all of a sudden you have less sugar available to consume the rest of the day. Why not save your ‘sugar bank’ for something you are really going to taste and enjoy? Your body will be able to absorb the nutrients in your Green Smoothie more easily when you keep it simple. Save your young green coconut for an afternoon snack later in the day. Avoid bottled coconut water. 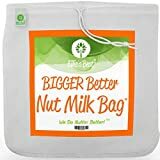 Add your homemade almond milk to a cacao, banana smoothie when you will really taste it and enjoy the texture of the fat….and spread your caloric load throughout your meals as well. If you are exercising a lot, for example after a 10km run, then yes….that would be a good time to add homemade almond milk, young green coconut flesh or young green coconut water to your Green Smoothie. The electrolytes in the live coconut are great for a post-workout recovery, and you will need the calories because you burned the calories. 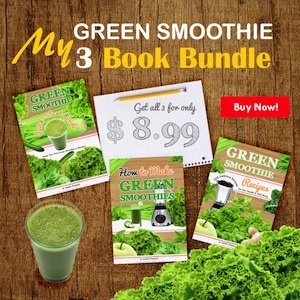 Green Smoothies are good for you because they are made from simple, whole ingredients. That’s why you feel better when you eat them on a daily basis. 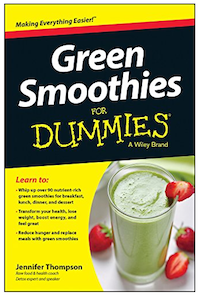 Add 1-2 cups of plain water to your Green Smoothie to make it more drinkable but leave out the rest. You can absorb all the wonderful natural nutrients from a Green Smoothies, as long as you keep them natural, whole and pure. 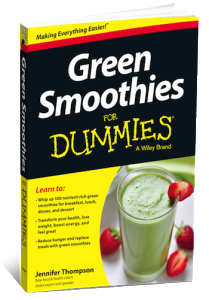 Check out my NEW book Green Smoothies for Dummies – I’ve got loads of recipes using dark leafy greens and many delicious combos without chemical additives or refined sugar. It’s so easy! 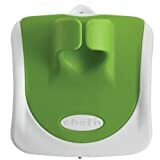 FREE Blendtec Blender Giveaway ($549.00 Value) – Yes, you can WIN!